When in North Western Australia, always look down when you walk. If the blue ringed octopus doesn’t get you the stone fish or the cone shell will! While I truly prefer a civilised life, occasionally one is obliged to come into contact with “THE GREAT OUTDOORS”! In July I traveled to Exmouth in the North West of Western Australia and spent ten days sleeping under the stars (quite literally as we had no tents for most of the camp). After travelling out to one of the rarely visited islands I went for a wander on the reef that had been exposed by the tide, looking for mud crabs as a possible dinner option. Thankfully I was wearing some old sneakers as after I had fruitlessly examined a rocky outcrop for crabs, I looked down and saw this blue ringed octopus in full attack colours literally centimetres from my left foot in a 5cm deep pool of water. The octopus itself was about 20cm long. I was lucky enough to have my camera around my neck and quickly took a few photos before hurrying away. The knowledge that I was centimetres from pretty much instant death was a little sobering and quite put me off my dinner of hardtack and water. 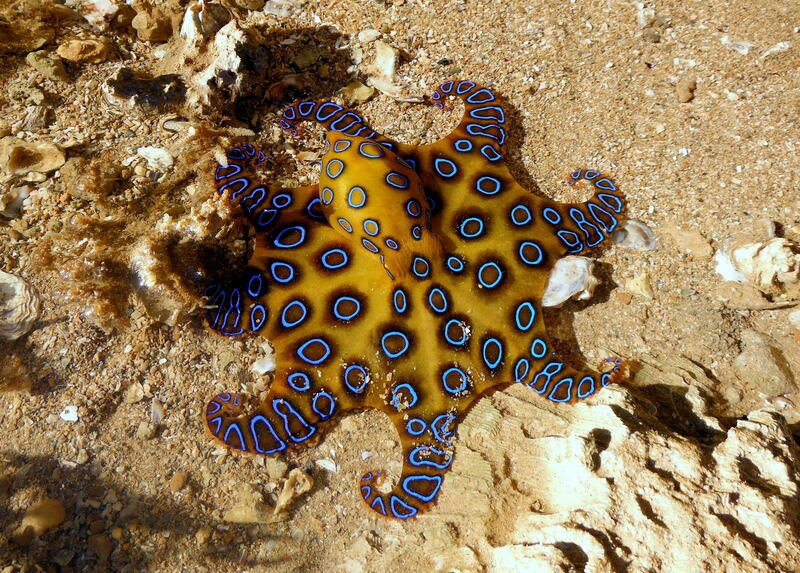 Anyway, you don’t often come into contact with blue ringed octopii (octopuses?) and this one certainly gave me a great picture, but this was definitely not an experience where the word “touching” would have had any positive connotations. You may also like to check out my stone fish encounter here and my shark encounter here. The picture is fantastic and what a cool story. And I am never going to Australia, because if it had been me, I would have accidentally stepped on him. Great capture! Scary thought about how close you were to death though. I always say walk cautiously aware of your surroundings. Glad you are safe! Oh, this is a rare creature. Would like to know more about it. I was so lucky to get a photo of it. It is very unusual to see one close up. Best wishes. Indeed, it’s a rare one! Best Wishes!